It is January 16, 2015. I have had one day to rest after my Rogers Pass experience and inevitably to run around to accomplish multiple mundane tasks. I have signed up for one of the “First Track Fridays” offered through the University of Calgary Outdoor Recreation Centre. 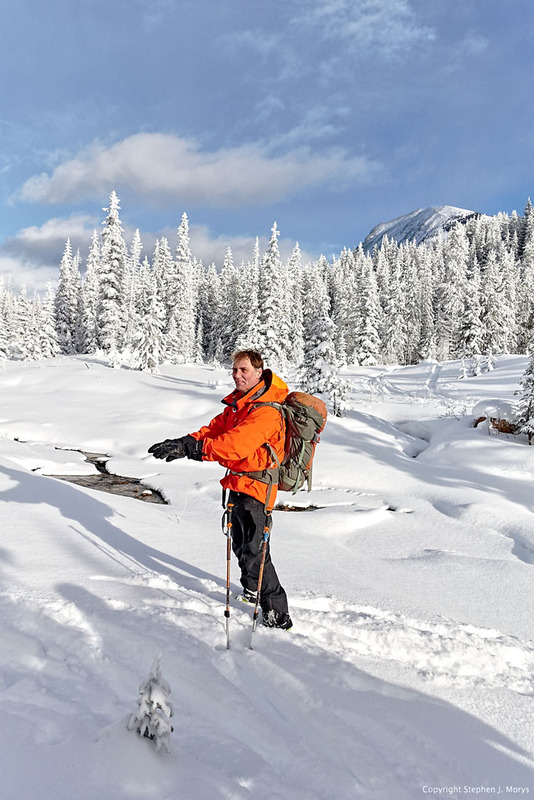 This is a great, economical and safe way to get into the backcountry with an experienced guide and like-minded individuals. Our group of five met early morning in Canmore, Alberta. 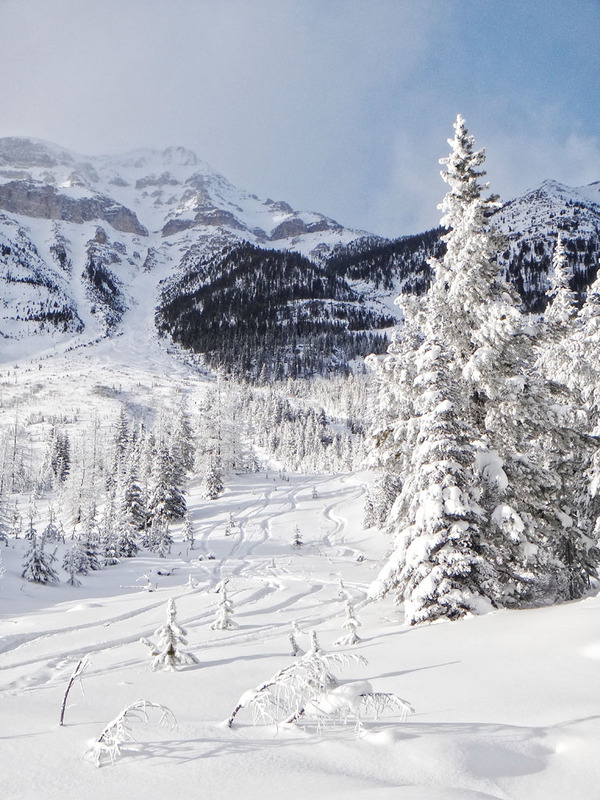 The original plan was to ski somewhere along the Smith-Dorrien roadway in Kananaskis Country. However, we were faced with the same problem as I originally had earlier in the week. The snow conditions were not great locally. After some discussion, we decided to drive further west, carpooling in three vehicles, towards Kootenay Provincial Park along Highway 93 South. Hopefully, the conditions would be better there. We initially decided to skin up to the “Fire Break”. 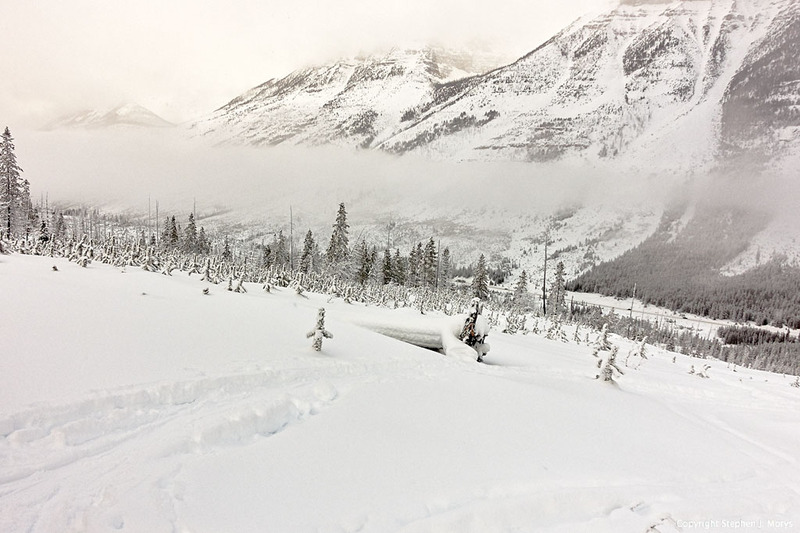 This slope is accessed from the Stanley Glacier parking lot. There were several massive forest fires in this area in 2003 sparked by lightning. As the name implies, a section of trees was removed to assist with managing the forest fire in this area. 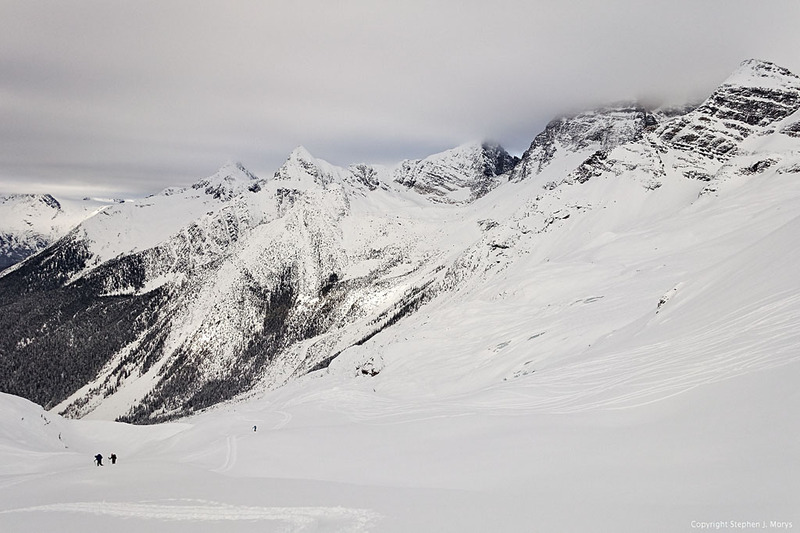 With good snow conditions, this area does provide a very safe and accessible backcountry ski slope. 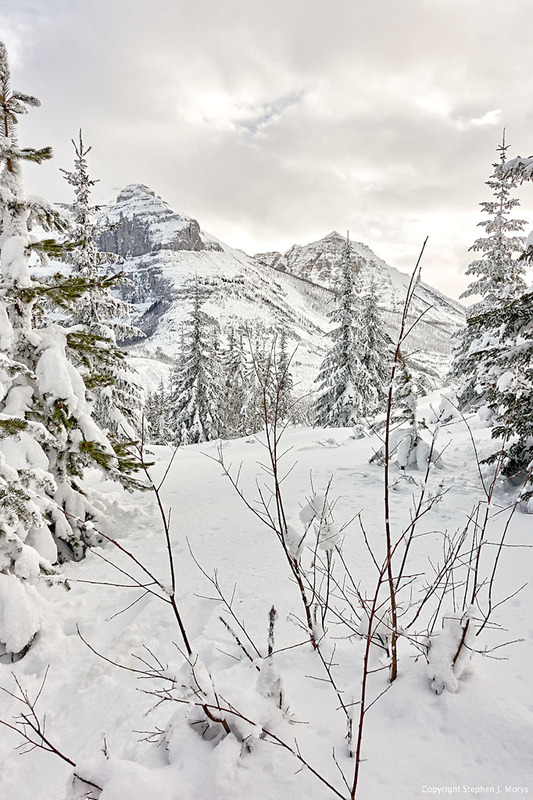 There are also wonderful views of the Stanley Glacier above and further southwest. The weather conditions were good but the snow base was rather shallow. One had to be very careful with barely covered rocks, logs as well as small trees. We found this out as we skinned up. Our up-track brought us out approximately halfway up on the Fire Break. It was a simple matter to skin up the slope to the crest. 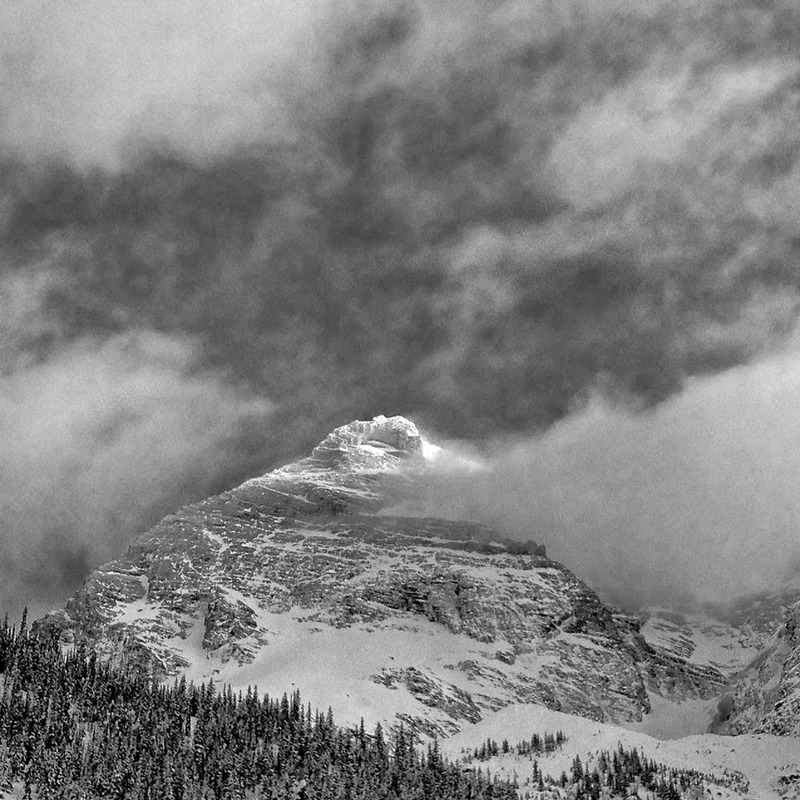 Some of the low-lying cloud did clear which provided excellent views of the surrounding mountain ranges including nearby Chickadee Valley, another popular backcountry skiing area. We accomplished several short runs on the Fire Break but our hearts and legs pined for more. Several of the group looked across the roadway at the opposite slopes and asked the guide Doug if it was possible to ski those slopes safely. Thankfully, he was up for it. 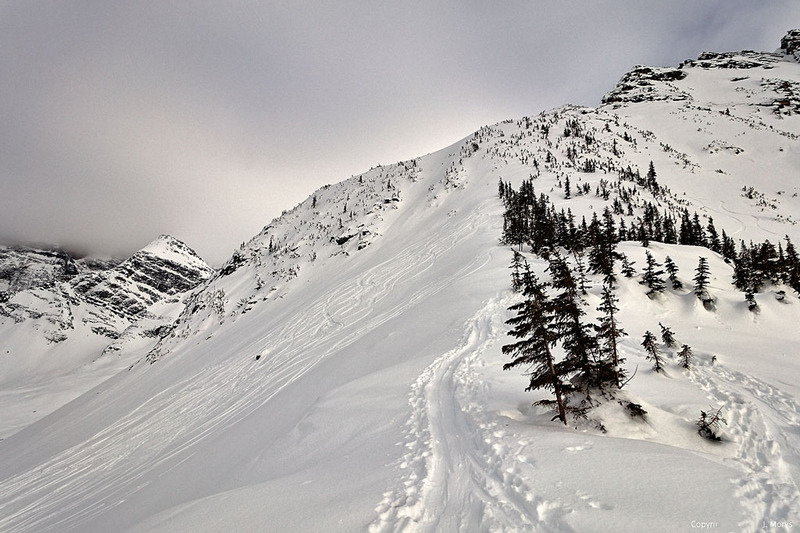 The avalanche conditions for that day at tree line were rated as moderate. 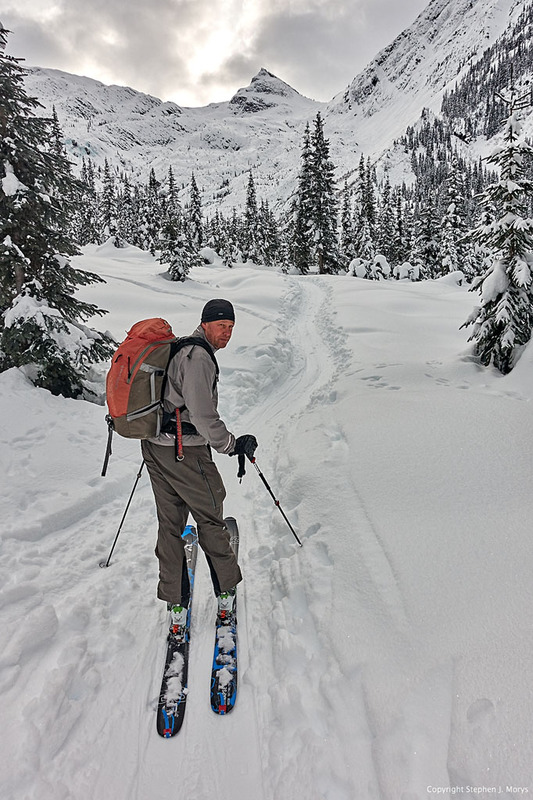 We crossed the highway like a band of ducks holding our equipment and then simply disappeared into the trees skinning up along an avalanche run-out pathway. Doug, our guide, did a great job of finding a route and also explaining why it was safe for us to proceed. 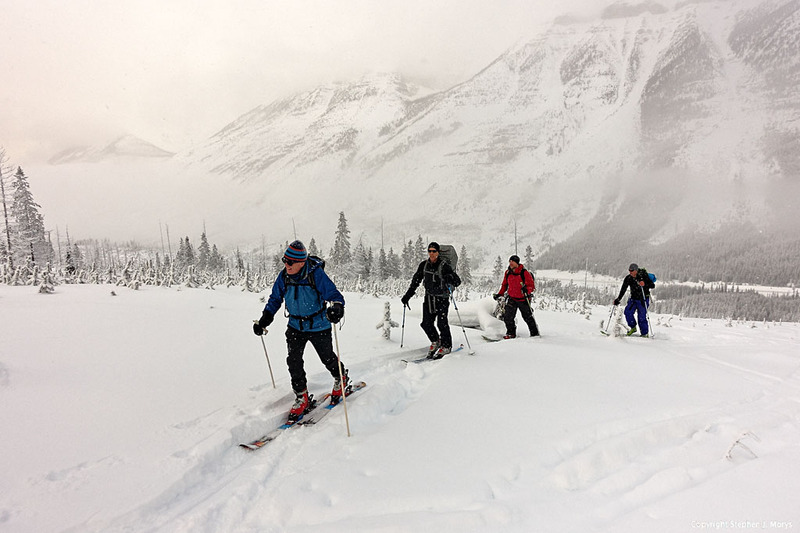 Backcountry skiing is all about assessment of your terrain, your party members comfort levels, the local conditions as well as making sound decisions. This up track was definitely more challenging and at times steeper than that of the Fire Break. Our group starting our skin up east-facing slope, Kootenay Valley. Photo courtesy of Anton van der Merwe. 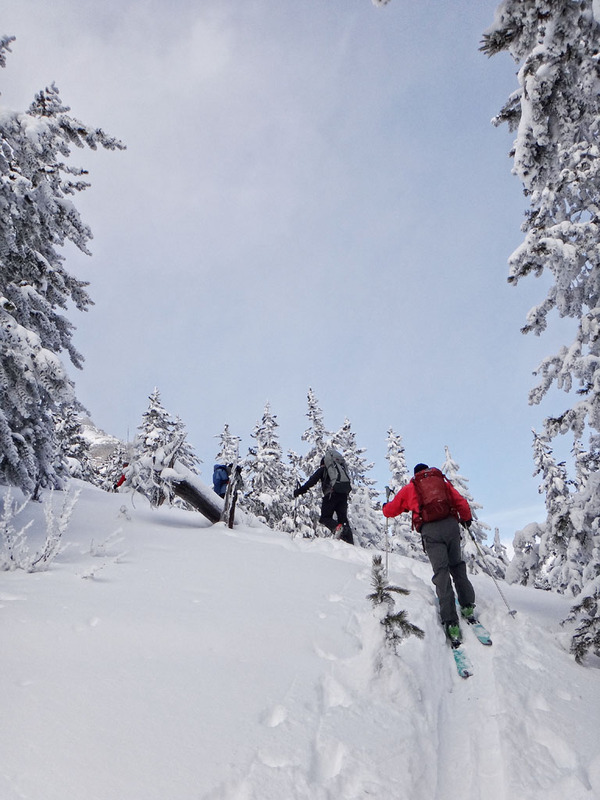 Part of our group working hard skinning up east-facing slope, Kootenay Valley. Photo courtesy of Anton van der Merwe. 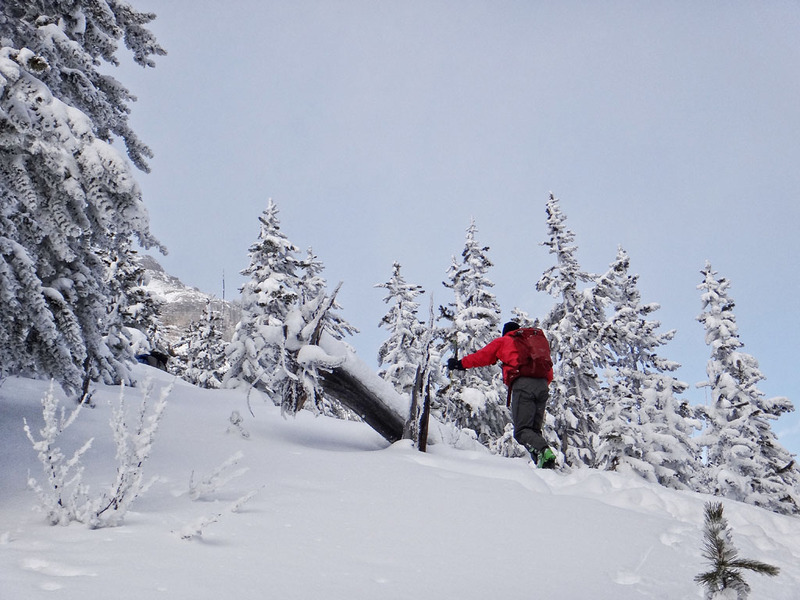 Steve working hard skinning up east-facing slope, Kootenay Valley. Photo courtesy of Anton van der Merwe. We ascended approximately 300 m before we decided on a good point to transition and reap the rewards of our efforts by skiing down. The sun came out and we had brilliant views of Stanley Glacier and the entire west-facing Kootenay mountain range. The ski down was fantastic. The snow was perfect. What a feeling! We were all thrilled we had made the decision to come over on this side to explore the slopes. We were only able to get one run in. We exited down immediately adjacent to the highway and it was already mid-afternoon. 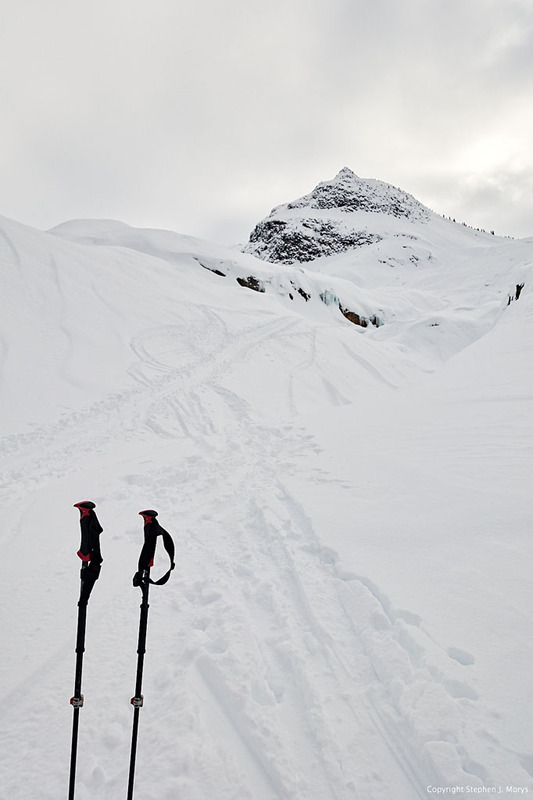 We were able to ski out without transitioning back into our skins in order to get back to our vehicles. We had a great group led by a very competent guide, Doug, who was willing to accept our suggestions, break trail and also had numerous really bad guide jokes! An example “How many mountain guides does it take to change a lightbulb? Answer-three. One to unscrew the lightbulb and two others to say good turns….good turns”. We drove back to Canmore and then everyone departed home. 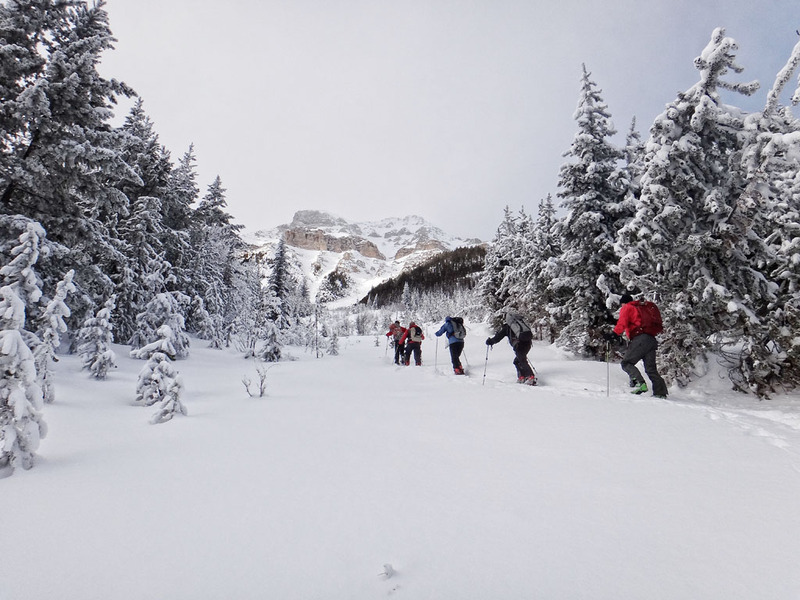 Like any skill, backcountry skiing requires practice, practice and more practice. First Track Fridays is a great way to accomplish this. I will definitely be back for more. Cheers! 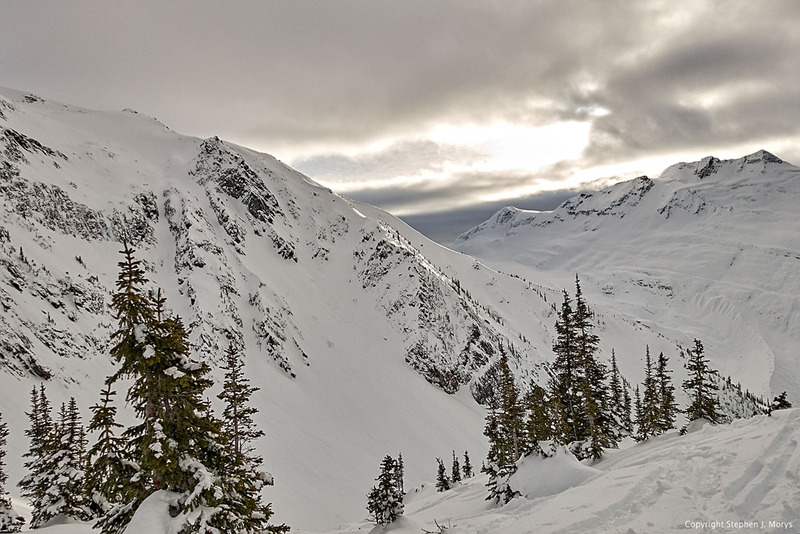 Here it is January 14 2015 and it is time for another adventure in Rogers Pass. I am feeling somewhat spent (I did ski too much at Lake Louise prior to coming out) and I did develop a blister on the right heel so I hope I am up for this. After a quick breakfast in Golden at a local bakery that Mark insists is the only place here that can make a decent espresso (he’s right), he asks me if I am capable of doing a similar or longer duration tour compared to yesterday. Without thinking I say yes. Thinking is overrated. He suggests Lookout Col and I agree having no idea what I am agreeing to. Where Mark leads I will follow- I trust him. We leave trailhead and set a reasonable pace to get warmed up and enter the llecillewaet Valley as we approach the moraine of the Col. I appreciate that Mark often takes us off the up track for teaching moments. The weather is perfect, warmer than yesterday, and there is little wind. I have applied moleskin to the right heel. I feel it a bit but it is not too bad. 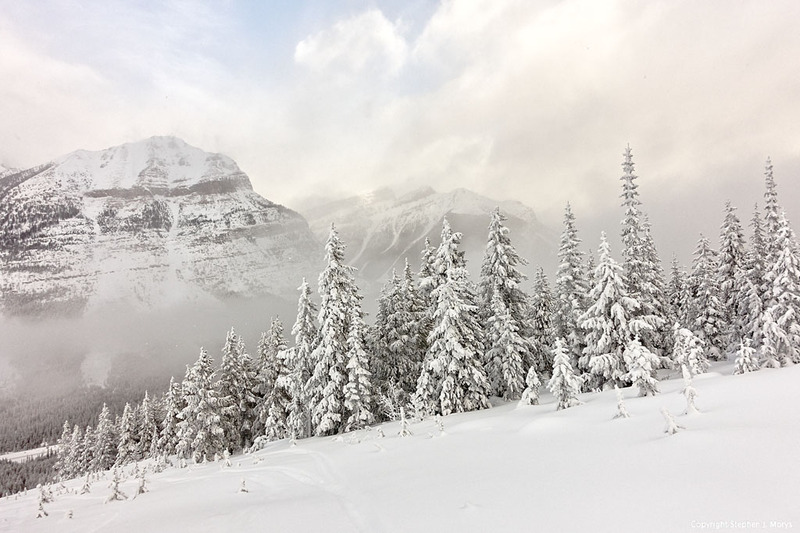 As we clear the trees the valley opens up and we get a great view of Mount Sir Donald as it’s peak pokes through the clouds. Brilliant. It is tougher going through the moraine and all I can wonder is how do we ski back down through this stuff? Then the climbing starts and I quickly learn that I am working way too hard and slipping too much. Mark notices my distress and gives me a quick lesson in skinning up steep icy slopes. It works and I get it. On site teaching! 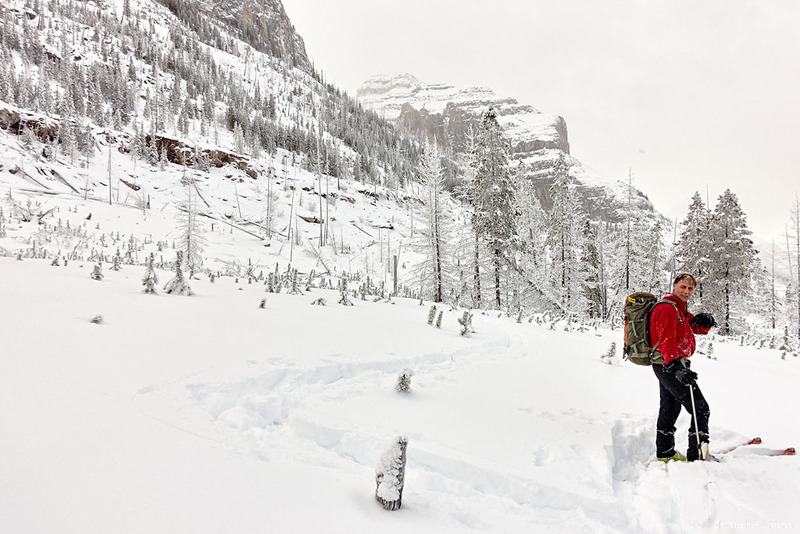 Mark chooses a great up track through complex avalanche terrain that I would never tackle on my own. Guide…. good! This area is much quieter than Balu pass and we seem to have the place to ourselves. Two other skiers pass us from Finland and we have a nice little chat with them before heading up again. Near the top of the Col Mark digs a snow pit and does a compression test. I ask him what he has gleaned from this and he says “it’s confusing and surprising”. Okay… I keep skinning up. Three other skiers are coming up the same slope behind us so I take a few pictures for perspective. We reach the top of the Col and take a breather and have a bite as we transition. It has been a long climb but I feel great. I look at my watch and cannot believe it is already after 3 PM. Yikes, we will need to get down soon. Will we make it before we lose light? The views are spectacular! 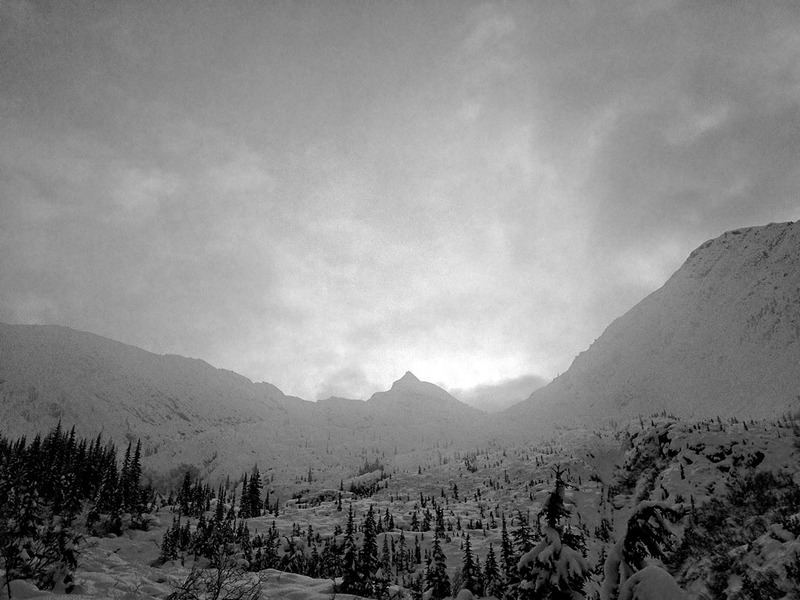 The sun breaks through and lights up the rim of a mountain on the opposite side of the Col. “Just breathe…..again”. We are set to ski! What a feeling. We are able to find virgin lines on the way down but I am happy that Mark is leading because the way down has no correlation to the way up. At one point Mark says follow closely here and stay away from the right as there is a cliff drop off. 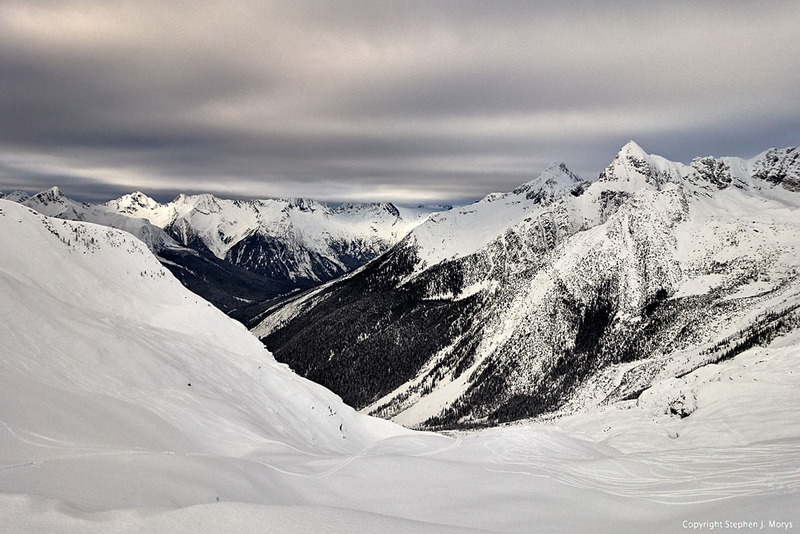 It is good practice to stop and look where you are as the ski down is so much fun. I can see it would be quite easy to lose perspective and ski off a cliff. Mind you, you would be smiling initially as you met your demise! We are approaching the moraine and this is the part that I fear. Mark calmly says “oh we will just head off on skier’s left and join the summer hiking trail that completely bypasses the moraine” that I did not see at all as we were skinning up. Yes! The remaining ski out is fun as we get thrown from corner to corner of the icy down track. It is like luge or bobsleigh sledding. Too much fun. We also pass a snow topped rock feature that you swear houses hobbits. We finish the tour and I am ecstatic. I feel strong and confident. What a great tour to accomplish. It’s all thanks to Mark as he points out we are back down in just less than a hour. 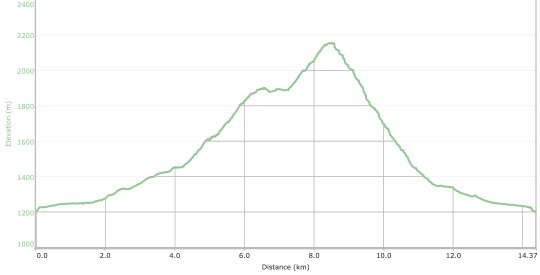 We climbed over 1000 m and travelled 15.4 km. We drive back to Golden and I drop off Mark as he drives back to Banff (his home) in his own vehicle. What a fantastic guide! I know I will be back to tour with him again. He is so knowledgeable- he taught and I learned. My skill set improved dramatically in two days and I know what I need to work on for future tours. I was able to get into terrain that I otherwise would never have been able to do safely. This was exactly what I was looking for in hiring a guide. I am driving back to Calgary tired but enthralled with the experience I have just had. It is so important to push yourself in new directions even though it would be easier not to and to give in to your anxieties and perceived limitations. We live in an amazing part of the world and I continue to be enriched by venturing into the mountains that I love. Here it is Day 2, January 13 2015 of my alpine touring adventure. I was feeling a little stiff this morning- mainly the quadriceps- after my rather enthusiastic day of resort skiing at Lake Louise yesterday. I certainly don’t remember feeling this stiff as well as all of this aching in my younger years! Ah….the ravages of time. Our destination today was Balu Pass. 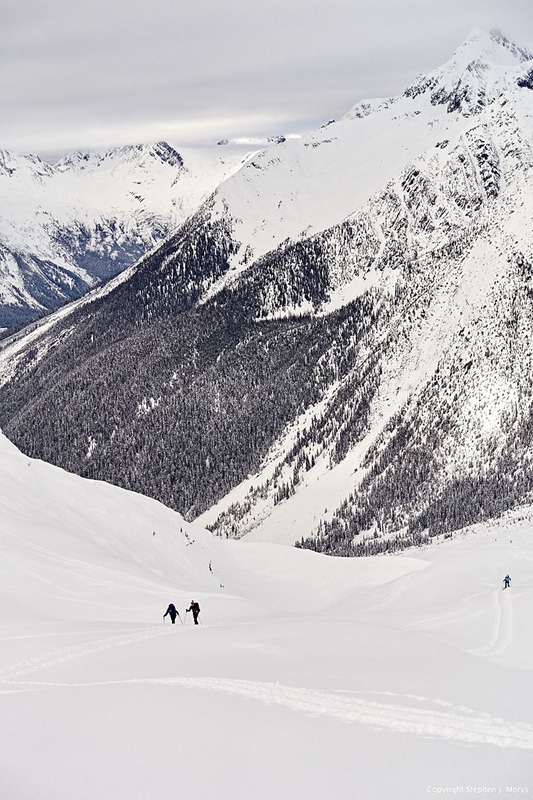 It is a popular area and a great introduction to the Rogers Pass backcountry skiing experience. It involves mostly skinning but there are several nice descents on the way down. Mark chose the perfect place to get me acquainted with my new equipment as well as to assess my capabilities. It was an awe-inspiring journey cradled between Mount Cheops on the left and Ursus Major and Ursus Minor on the right. Mark also pointed out the exact spot where the Strathcona school tragedy happened. Very sad and sobering! Our avalanche risk today was quite low. The temperature was nice and there was little wind. It was a great climb. I thought I had forgotten my camera as I could not find it at trailhead when we departed. I had to rely on Mark to take a few cell phone shots to document our day. I had a cell phone as well but when I took it out it was out of charge. The gods of photography were against me today. 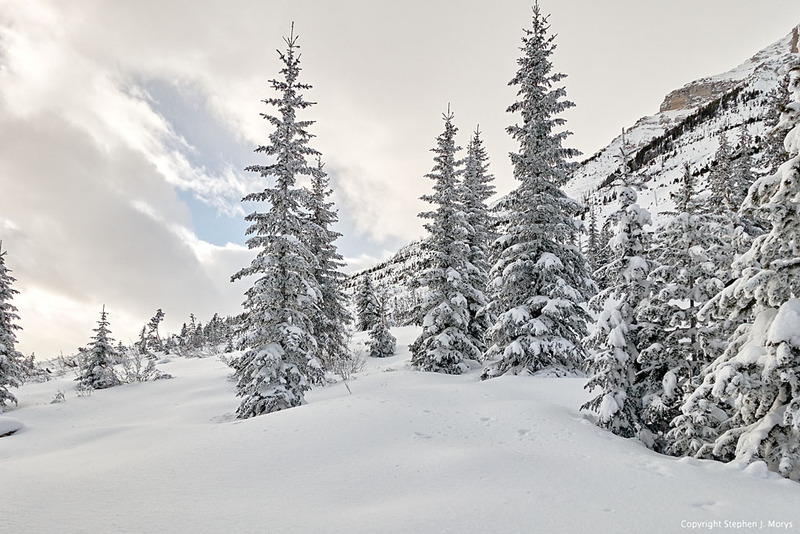 As we approached the top of the pass, the sun shone strongly and lit up snow covered trees and surface hoar on pristine snow which twinkled like diamonds. Mark was ahead leading and I just had to stop and watch as he broke trail through this magical snowfield approaching the crest of the ridge as the sun shone as a brilliant orb in front of us. I had to “just breathe”- as the Alberta Tourism ad says- and soak it all in. Breathtaking! After a quick bite and transition (like triathlon, just with ski bindings/boots), it was time to head down. Mark chose a nice line and went first. He waited at the bottom of the first pitch for me. 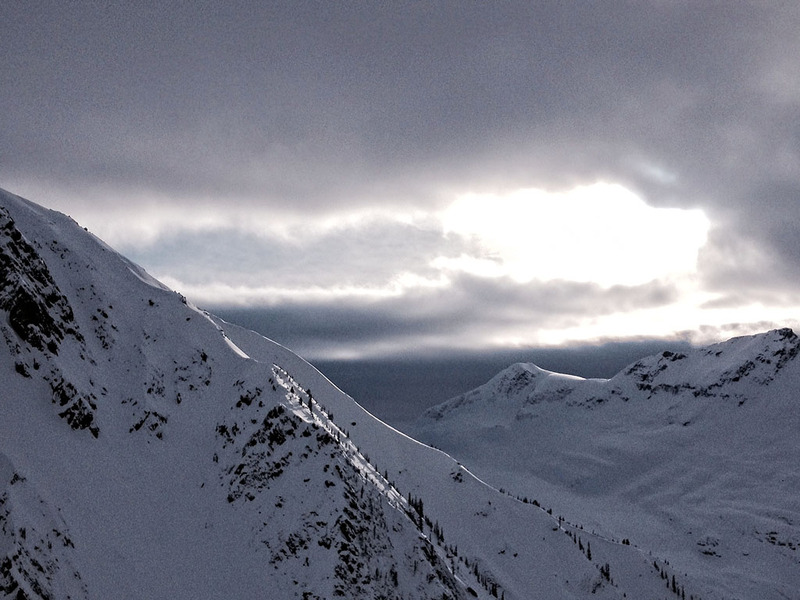 I am not sure why backcountry skiing is different to me psychologically compared to resort skiing but it is. The mind can play tricks on you. To my surprise I did fine. What a feeling floating through snow surrounded by all of this beauty. More….”just breathing”. Mark had great pointers to improve my ski technique but there was no drama on the way down. The descent itself is a very long ski out on the slick up track that transforms into a Hot Wheels track on the down track. Taking it slow and cautious is the key. We got out earlier than expected. 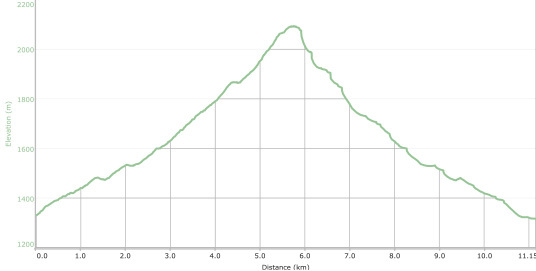 Our total elevation gain was 802 m and total distance travelled was 11.1 km. Not bad! I had aching quadriceps and cramping thigh adductors as well as a hot spot on my right heel. All in all only minor issues! Mark was a fantastic guide. I learned a lot in terms of what to do in an avalanche, practicing beacon search skills, equipment tips/tricks and especially skiing technique. A great guy and so knowledgeable. His experience comes through in aptly demonstrated confidence and reasoned counsel. This was exactly what I was looking for in hiring a guide. We drove back to Golden and upon our return I promptly found my camera on the “other” bottom of my pack (ohhhh! as Homer would say). We had a great dinner at a local restaurant. Then it was back to the motel for a soak in the hot tub. Simply put, I am finding the hot tub a necessity, not just a passing fancy….I may have to get one for that new backyard of mine! Stuff always leads to more stuff. Tomorrow’s adventure is a surprise as Mark has not yet decided where we will be going in Rogers Pass. Like Christmas Day, I will have to wait for my present in anxious anticipation. You will have to stay tuned. I know, it’s like one of those cliffhanger episodes on TV. Okay, now I am being a little dramatic. Time to sign off. Until next time. I’m Back Baby, I’m Back……Skiing! Hello again everyone. Courtesy of a very nice locum physician I have the next 2 1/2 weeks off. Thank you Diana. What better way to celebrate then to get back into skiing. I skied quite a bit when I was younger but lost interest over 30 years ago when I started University. I transitioned to cross country skiing, snowshoeing, hiking, running and eventually adventure traveling. 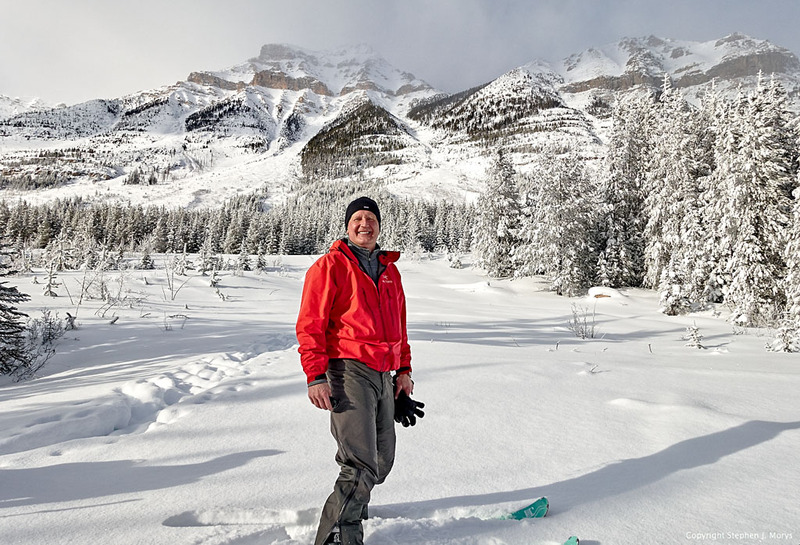 Last year I took an introduction to backcountry skiing through the University of Calgary and also completed my Avalanche Skills Training I and II. 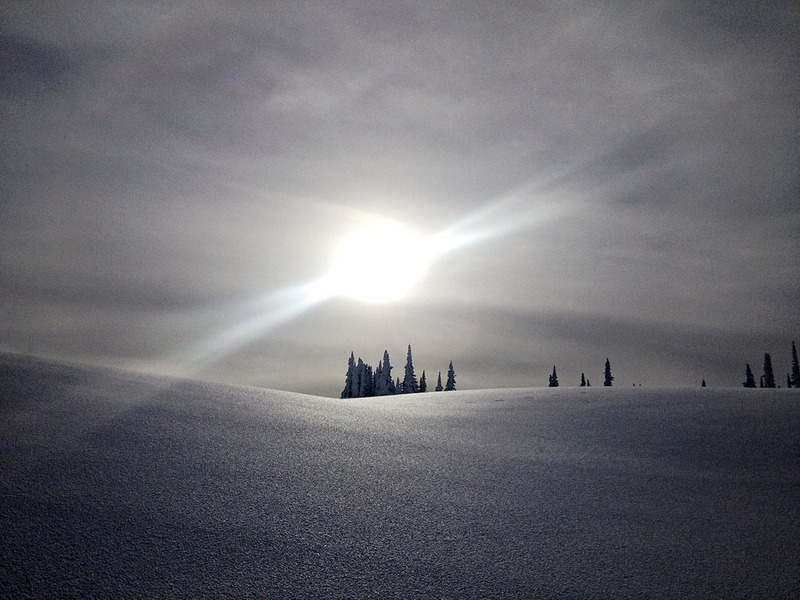 I thoroughly enjoyed myself and rediscovered the joy of skiing through unmanaged snow in the glorious backcountry. I was smitten! This year I decided to purchase my own equipment and start to get some practical experience. I must admit, I was somewhat overwhelmed with all of the different equipment choices. I finally settled on a system but boy was it a lot of work to purchase, fit and pick everything up. I finally got everything settled two days before I left West! I organized two days with a mountain guide but wanted to get some downhill experience before I joined him. Luckily, the backcountry gear that I purchased can be used for resort skiing. I have always loved Lake Louise. It just happened that when I was having my boots punched (don’t ask- I really have a melodramatic right foot) at Lou’s Performance Ski Centre, he mentioned a great deal for a private lesson with a level 3/4 instructor at Lake Louise. I thought, this must be fate! 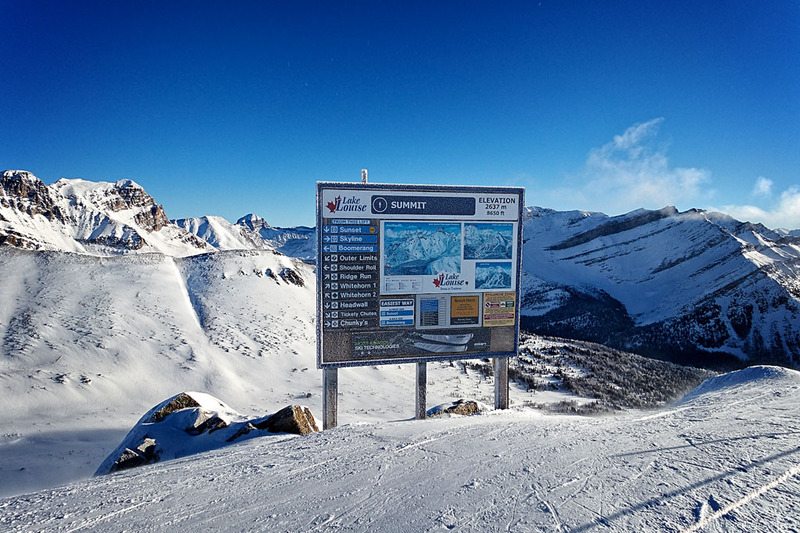 I purchased the lesson and called Lake Louise and they happened to have a spot available on January 12 at 830 in the morning. Saturday and Sunday prior to leaving was crazy! I couldn’t believe how much I had to organize in order to get out for this week. This does seem to get harder as one becomes older. Maybe it is indecision. I’d like to think that is the case and not cognitive decline. I was exhausted when I went to sleep at 930 PM on Sunday night, of course, because I was exhausted I was up at 3 AM on Monday morning. Why, oh why! I met my instructor Ai (Japanese, not artificial intelligence) and we went out for 90 minutes to check and critique my technique. It was very helpful. I always suspected that I leaned forward too much with my turns. She picked up on this right away and we worked on improving my technique. I then had a glorious day to explore the hill. It brought back great memories. I even remembered most of my favourite runs. 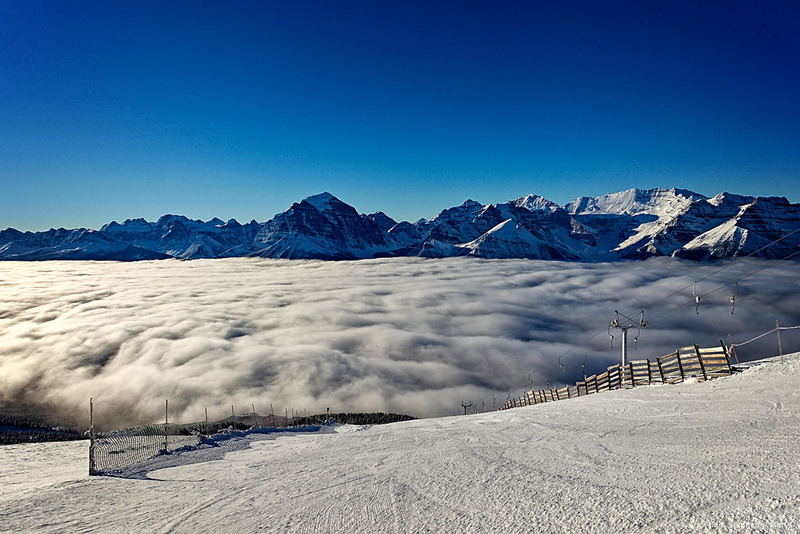 There were spectacular views from the top of the Summit T-bar of an enormous cloud bank in the valley below and brilliant blue sky above. 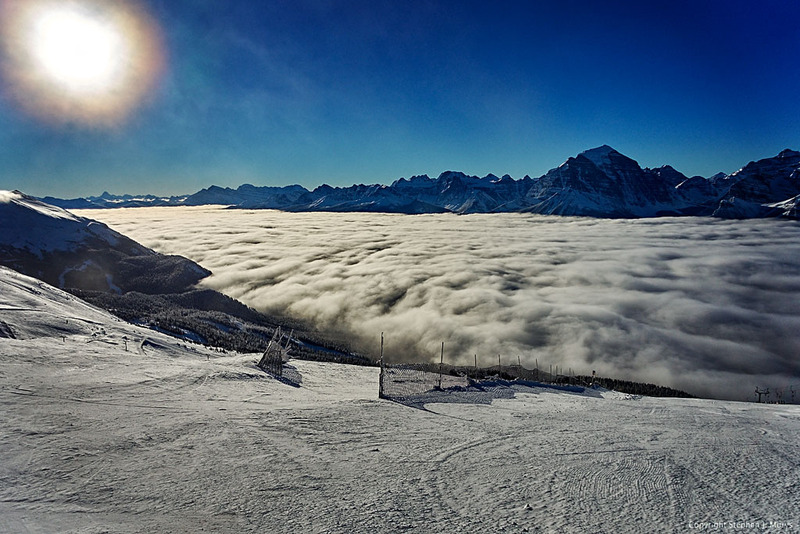 I remembered why I love Lake Louise so much. All of the equipment worked perfectly. Even my right foot did not complain! I was thrilled with my purchases. I drove to Golden BC afterwards and settled into a hotel after some shopping, a nice dinner and an even nicer hot tub! 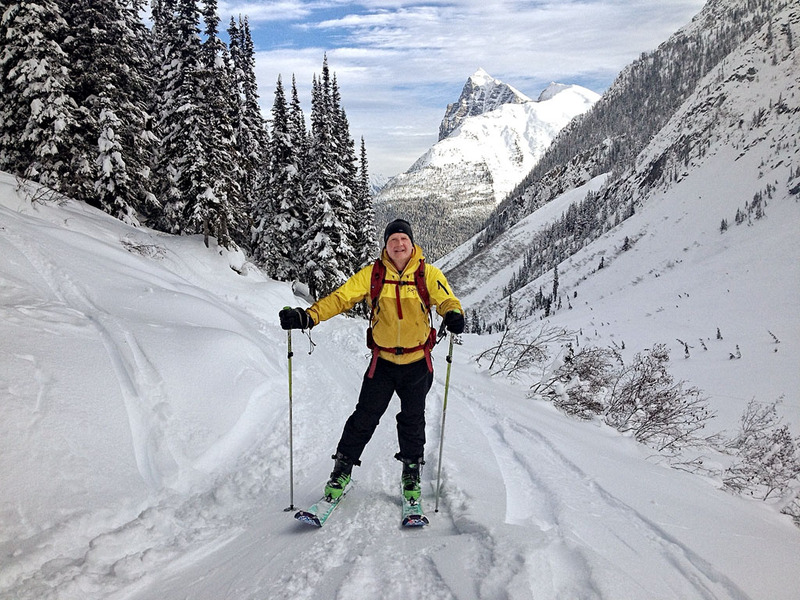 I got in touch with my mountain guide Mark Klassen- alpinism.com- and we will be heading out to Rogers Pass to try some real Alpine touring and skiing. I hope I am up for it. Certainly the mind is but as I age the body keeps questioning my choices. Hopefully, I will have a much better sleep tonight. We head out early tomorrow morning and our destination is Balu Pass. I think Mark wants to check out my abilities before he offers me more challenging terrain. Smart man.